The event was highlighted by alumni guest speaker Derek Kucksdorf ’11. Derek earned his BFA from UW-Stevens Point in 2011. During his senior year, Derek co-designed the Cousins Subs location near campus with a UWSP theme. Since then, he has received his MFA from the New York School of Interior Design and has worked, been published with, and trained with some of the most recognizable names in the design industry. He is currently the Midwest Regional Manager of Sales for Arper USA. Proud to be from the Midwest, he will be returning this May from New York to work full-time from Arper’s office in Chicago. Pat Kluetz spent 25 years as a professor at UW-Stevens Point and many years as a practicing professional. Her passion to this day is her students and what opportunities the profession offers emerging designers. The Jane Wright Abrahamsen Scholarship was established in 1994 by Martin Abrahamsen in memory of his wife. A 1933 home economics graduate, Jane was a member of the Home Economics Club and the women’s basketball team. She taught for four years, then went back to UWSP for graduate credits. She was an employee of the U.S. Department of Agriculture and the University of Maryland. Bernice Kurzynski retired from UWSP after 37 years, including serving as the academic department associate in the Division of Interior Architecture. As a UWSP alumna, Bernice was always dedicated to her work and service to the university. Her scholarship was established by IA faculty and staff at the time of her retirement to honor her endless contributions and service to the division. This fund was established to provide a scholarship to a part-time student employee in interior architecture, family & consumer sciences or dietetics. This scholarship was established by Bessie May Allen, director of the Home Economics Department at UWSP for 39 years. Bessie May shaped the home economics program at UWSP, taking it from a two-year course of study to a four-year program. She was vital in keeping the program alive, bringing it back to campus after the UW System Board of Regents had voted to eliminate it. Agnes Jones was a high school home economics teacher, a supervisor of home economics student teachers at UW-Madison, and home economics department chair at Northern Illinois University before she was appointed as head of home economics at what was then Wisconsin State College-Stevens Point in 1957. Jones and her faculty were innovative creators of programs and during one five-year period received more than half a million federal dollars. She and Bonnie McDonald were early pioneers in the Wisconsin Head Start program. Mary Ann Baird, head of the Division of Interior Architecture from 1978-96, established this scholarship upon her retirement from UWSP. She taught at UWSP for 38 years and established this scholarship to assist students interested in semester international study programs. Natalie Ciulla was an alumna and instructor in the Division of Interior Architecture. Her husband Paul was also dedicated to quality design. Natalie’s mother Antonia Nichiporuk with close family friends, Kar-Keat Chong, Ann Fitz, Kathe Julin, and Pam Leviton, established a scholarship in their names to support young designers. Pat Kluetz, our featured Donor Speaker, had the unique opportunity to work with talented and creative students who have emerged from our program to become impressive professional interior designers. She continues to be involved in teaching and continuing education programs on campus and has served as a professional liaison to the Division of Interior Architecture ASID Student Chapter. Scholarships and internships are given to participants in the latest design and showroom competition for this dual branded location in Plover: Furniture and Appliance Mart and Ashley HomeStore. Our students competed in a design phase, where four teams were chosen to then compete in setting up and showcasing Ashley Furniture products. It is made possible by the generosity of Bill Fonti, who is President and CEO of Boston FAM dba Furniture & ApplianceMart, Ashley HomeStores and MattressMart. Bill and his company is pleased to be a part of such a great project that helps empower students. 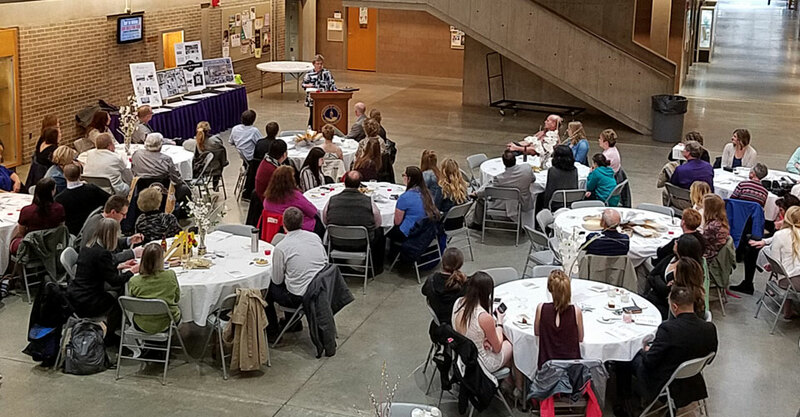 The funds for this scholarship were generated through a raffle held at the annual UWSP ASID Student Chapter banquet for students, alumni and faculty. The scholarship is awarded to students who have made significant contributions to the ASID Student Chapter. The Reinowski Memorial Scholarship was established for the advancement and dissemination of theoretical and practical knowledge of the science and art of illumination.